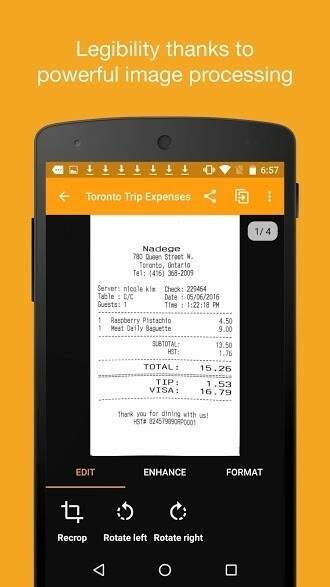 Whether you’re looking to log receipts for a big project or handle business on the road, scanner apps let you forget the hassle of dedicated scanners or bulky all-in-one printers. Better still, most apps make it simple to share scans, mark up images, and put your scanned documents to use. When trying to find the best scanner apps for Android , we looked at multiple factors and found 5 options we feel represent outstanding value. 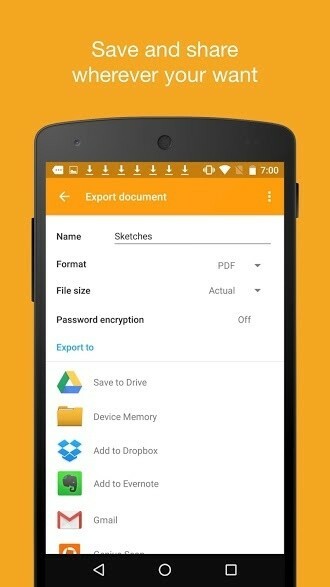 If you're looking to capture or share documents from their phone or tablet, these are the best options. The app comes in two different versions -- but the free version is likely more than enough for most users. Features include the ability to export to PDF or JPG, multi-page scanning, and enhanced color filters. However, where this scanning app shines is ease of use. It uses automatic page detection to crop your scan, optimize the perspective of the shot, and improve the quality of the captured image -- all without the need for user input. Just frame the page on the screen and let ScanBot take care of the rest. Upgrading to the Pro version from inside the app brings OCR text recognition, signature capture, smart file naming, and the ability to theme the app. If you’re scanning sensitive information, Pro also allows you to lock the app with a password to keep your information secure. While not deal breakers for many, power users may find the upgrade a good value. With a 4-star rating and more than 35,000 reviews on Google Play, Scanbot is one of the most popular scanning apps for Android. It also received a Google Editors' Choice award in 2018. One reviewer says, "I tried most scan apps: this one is the best. Mostly because of the various filtering options, which allow creating a clean PDF that e.g. prints white as white and not gray. Apps like Office Lens don't have this or it's inferior." PC Magazine reviewed the app and said, "ScanBot is a Swiss Army Knife of scanning tools, with reliable image capture, text recognition, and document annotation." 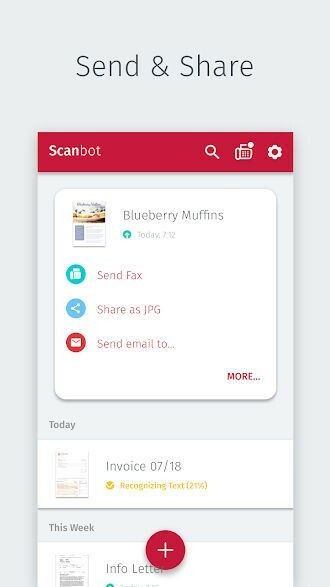 If you're looking for a good all-around app that covers the basics and offers a flexible set of tools for capturing and sharing scans with your phone, ScanBot is a simple, easy-to-use option. FineScanner is one of the newer entries on this list. And it would be the Editor's Choice but for a single issue -- they just suffered a security breach as reported by BleepingComputer . However, at the time of writing, the company appears to have fixed the security concern in question and is working to mitigate any damage and investigate the extent to which data was accessed. With the nasty mark out of the way, this app offers a number of features you simply can't find in other apps. The dual-page scanning mode makes it easy to scan in bound documents, such as textbooks, while the OCR available is the best in the entire lineup. Other features include the ability to annotate scans, password protection on PDFs, multi-page scanning, and scan enhancement filters. 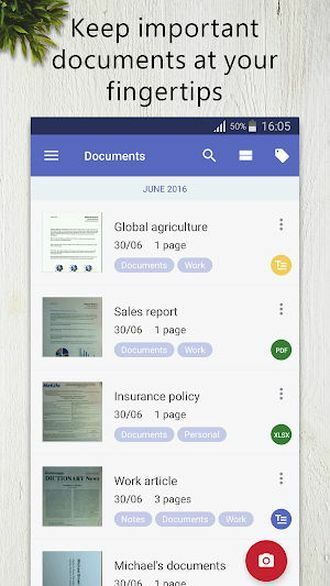 The free version of the app is limited to 5 scanned pages at a time. However, you can subscribe to the app for $9.99 to unlock unlimited pages. The app enjoys a 3.75-star rating with more than 1,800 reviews on Google Play. One reviewer notes, "Never thought document scanning would be so easy and effortless. It is great." PC Magazine awarded the app an Editor's Choice award in their "Best Mobile Scanning Apps of 2018" list. Reviewers state, "[We awarded the app] primarily because of the superior quality of its text recognition and the persnickety amount of control it gives for the actual scanning process. It takes a while to get the hang of its user interface, but the results justify the investment." While the app has suffered a data breach recently, the features on offer -- particularly the OCR quality -- create exceptional value. If things stay clear on the security front, we could easily see this making the top of our list again soon. GeniusScan features a dead simple interface and one of the best scan qualities we’ve seen among scanning apps. All of the post-processing to make your scan pop is done on the phone without uploading your shots to a server. This makes it one of the faster apps on the list. The free version includes everything you might need for basic use. While you still must tap the screen to capture, the app handles all the other optimization options -- such as perspective shifting and contrast balancing -- automatically. Upgrading to the paid version of the app, Genius Scan+, will set you back $4.99 and unlock better integration with cloud storage services, the ability to quickly create multi-page scans, and integration with their Genius Fax app. The app has more than 43,000 reviews and a 4.5-star rating on Google Play and more than 1-million installs. One reviewer notes, "Got this for work and now I use it to keep my life in order as well, very easily digitizing tons of documents. I especially like the cropping feature, I can take any old picture as long as it isn't blurry, then crop out the background so it looks like any other scan." PC Magazine reviewed the app and says, "Genius Scan Plus is a solid, basic mobile scanning app, and inexpensive enough to be a handy asset installed on your smartphone. It's a good value for the money." If you're looking for a simple way to fax without having to deal with an actual fax machine, Genius Scan is a great option -- and a competent scanner too. It features a wealth of automated options to make scanning effortless as well. 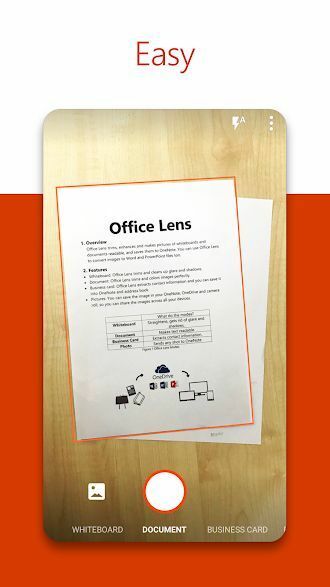 Office Lens is a wildcard. If you regularly use Microsoft Office or attend meetings with endless whiteboard presentations, you should definitely consider this app. It integrates with common Office suite applications -- including Word, Powerpoint, and OneNote -- providing additional formatting options you won’t find in the other apps. If you want to share with other apps, you have to save the image to your gallery, then share it from there -- not exactly hard to do, but an extra step compared to most other scanner apps. 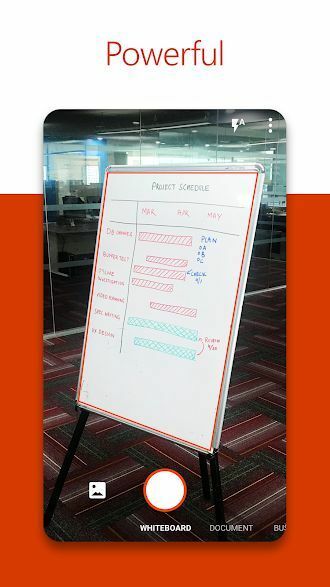 Its whiteboard mode is designed to help eliminate glare and improve clarity for capturing those fun stick-figure explanations of last quarter’s earnings in vivid detail and works great. The app’s weak point is options. It's a one-tap affair, providing little in the way of tweaking your scans if you’re not happy with the results. Still, with a low price tag of free, it's a handy way to bring scanned documents into common productivity software for editing or sharing. With more than 290,000 reviews and a 4.75-star rating on Google Play, it's one of the highest rated scanning apps available and has racked up more than 10-million installs. One reviewer notes, "This is so awesome!!! I love being able to "scan" photos and pages into my phone. I use OneDrive, too, so it just immediately appears on my computer in seconds, too! I have not used our flatbed scanner in weeks! That is very unusual for me!!" If you're looking for a scanner that compliments the popular Microsoft Office productivity suite, OfficeLens is awesome. If you're looking to use it with other providers, such as DropBox or Google Drive, it's not quite as straightforward but still produces great results with a few extra taps than most apps. As one of the newer additions to the scanner app market, TinyScanner is gaining a crowd of happy followers. The app offers cloud storage integration, faxing, image editing, and password protection for an affordable price. Instead of offering endless menus of controls, the app uses a few simple sliders to help you hone your scan quality and get great looking results. While there is a free version, it limits you to emailing your scans and only allows a few scans before prompting you to upgrade. Jumping to the paid version of the app improves scan quality, offers slightly better image optimization options and more export options when creating PDFs. One area where this app still falls behind others is a lack of post-processing. Where most apps now will adapt settings automatically, you must tweak settings prior to capturing the image to get the most out of your scans with TinyScanner. The app has a 4.75-star rating with more than 290,000 reviews on Google Play and more than 10-million installs. 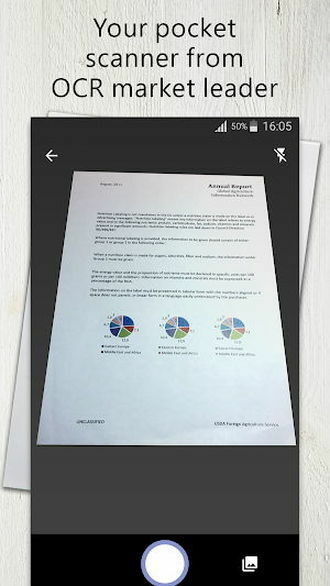 One review notes, "So easy to use I scanned several documents needed for work using this amazing app, saved them in Google Drive and printed them out, all in a couple of minutes. I couldn't recommend this app enough! Five enthusiastic stars..."
Another reviewer says, "This is an amazing app. Doesn't require any login before use so you can get started right away. Also, it does a GREAT job at taking out any shadows that might be cast by overhead lighting. It has auto edge detection like many scanner apps but it can also help prevent distortion by straightening out the image. The end result is a very good looking scan." If you're looking for good mobile scanning app with a simple way to adjust the captured images, Tiny Scanner uses one of our favorite approaches on this list. The collection of sliders and buttons makes it easy to dial in results without having to jump through menu after menu of settings. With a great set of features in the free version of the app -- and an affordable and impressive paid version -- we have to go with ScanBot as our current Editor’s Choice. The free version offers one of the more comprehensive scanning tools available and the paid additions are welcome options for power users and business professionals. Add in the automatic page detection and simple operation and we feel that the app outshines both the cheaper and more feature-filled competition. The picks in this roundup are what we think are the top Android scanning apps for most people. We selected these apps based on analysis of expert reviews from around the web, user feedback on sites like the Google Play Store, forum comments on our site, social media discussions, and more. A scan is only useful if you can read it. And if you just wanted a picture of what you're seeing, you could just use your phone's camera. We picked apps that go beyond simple image capture and offered a range of features to make scans easier to read. There's a good chance that if you want to scan something, you also want to either file in a safe place or send it to someone. All of our picks offer local file saving, cloud storage support, or the ability to send scans to others to help make using your scan easy. With the competitive nature of app markets, we don't see the need to pay an arm and a leg for a scanning app. All apps on our roundup are available at a reasonable price. While upgrades and additional features might cost more, the recommendations we list seemed reasonable to us. 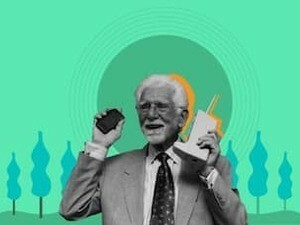 The best place to find out about how an app works is from the people using them every day. If there's a problem, reviewers will usually let you know in a hurry. We compared the things most people consider when choosing an Android scanning app. P.S. If you’re just looking for a quick scan and don’t plan to use the feature often, you might find that Google Drive already offers everything you need. Google offers full instructions for accessing the option here . 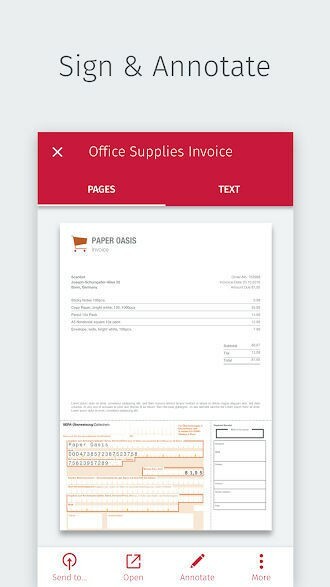 While you won’t find much in terms of sharing and optimization choices, it’s perfectly acceptable for quick captures of receipts or when you need to copy a document in a hurry. P.P.S. Planning to scan often? The clever tinkerers at Instructables have instructions for a cheap phone mount that will ensure great framing, eliminate shaky scans and breaks down quickly for on-the-go use.